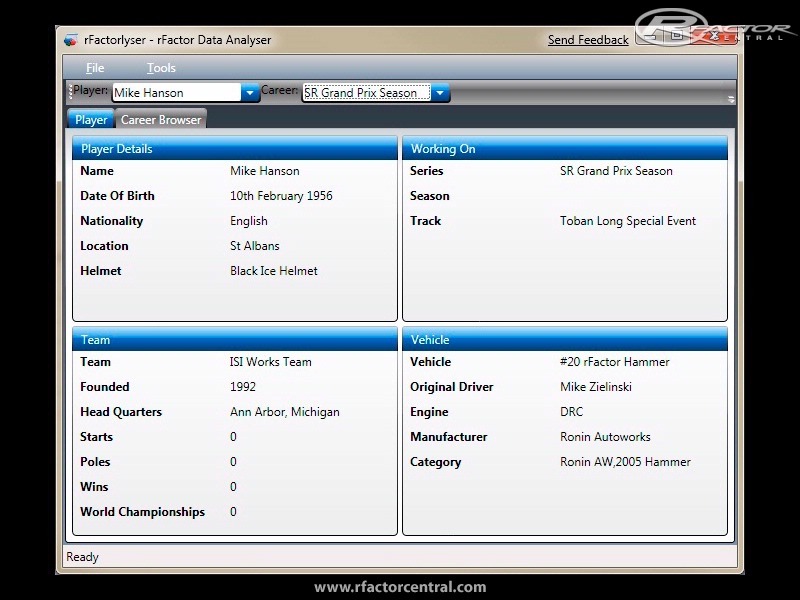 rFactorlyser is a Microsoft ClickOnce application built on the .NET Framework 3.5 SP1 for analysing data contained with in the many rFactor data files. Initially it focuses on browsing and analysing career data but as it's development progress all data will be available for viewing and analysis. As a ClickOnce application rFactorlyser is installed directly from the Internet and updates automatically at each startup. Hi Mike, would it be possible to compare laps or races side by side, or even better to be able to run races one after the other and give away points for the fastest one. (Almost like a hot-seat mode for rFactor) If you're willing I'd test and the like. All suggestions for how you might want to analyse your rFactor data are very welcome.